← Musaceae – GIANT HERBS not trees! Lentibulariaceae are herbaceous, terrestrial, epiphytic or aquatic carnivorous plants. The leaves can be alternate, scattered on stolons or whorled in rosettes, entire or divided, and sometimes heterophyllous (different shaped leaves on same plant). The inflorescences are terminal or lateral, racemose or simple, sometimes with paracladia present, though can often be reduced to a single flower. They can be braceate with prophylls present, and can sometimes be connate. The flowers are zygomorphic and bisexual; the calyx can be 2-4 or 5 partite. The corolla is sympetalous (fused) and usually spurred. The upper lip is either entire or 2-lobed, while the lower lip often has a distinct gibbous palate and can be entire or 2-5 lobed. Two stamens are present in the abaxial half of the flower. The ovary is superior, unilocular (single chambered) with two fused carpels. The fruit is usually a capsule (simple, dry fruit). There are three genera: Utricularia, Pinguicula, and Genlisea with around 320 species in total, making it the most species-rich family of carnivorous plants. They are cosmopolitan in their distribution, ranging from sub-arctic to tropical forests. The family has been a headache for taxonomists, as their vegetative morphology is quite difficult to define. Lentibulariaceae have several characteristics that set them apart from other vascular plants. Two of the genera, Genlisea and Utricularia, are rootless while Pinguicula produce a single, ephemeral root that is replaced by adventitious roots. The plasticity of shoots and leaves in Utricularia has been a topic of much discussion and confusion. Most often for the sake of simplicity, the leaf-like organs are regarded as leaves and the cylindrical, indeterminate structures carrying rosettes and other organs are called ‘stolons’. Leaves are linear to broadly ovate, with leaf margins in Pinguicula and Genlisea being entire. The leaves of Pinguicula can be fairly large (P. gigantea can produce leaves >20cm) and are fleshy. The leaves (or, at least, leaf-like organs) of Utricularia vary throughout the genus, being entire or divided, linear to obovate, reniform and even peltate. Leaf dimorphism occurs in all three genera which, in temperate species, is associated with hibernation. In Utricularia, the carnivorous traps are separate organs to the photosynthetic leaves, while in Genlisea and Pinguicula, the leaves perform both roles. Vascular bundles are present in the shoots of Pinguicula, but absent in Genlisea and Utricularia; however, vascular bundles are present in the leaves of all three. A reniform (kidney shaped) leaf of Utricularia reniformis Showing the vascular bundles (veins). The inflorescence is a raceme, which in some cases is reduced to a single flower. In Pinguicula, only the main florescence develops. In Pinguicula and Genlisea, the calyx consists of five lobes, while in Utricularia they are two-lobed, except for the subgenus Polypompholyx which are four-lobed. Pinguicula are annual or perennial herbs, terrestrial in general, but sometimes epiphytic. 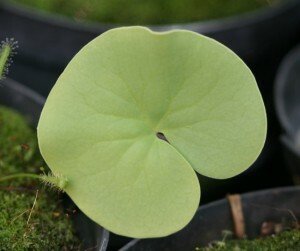 They have a short stem, with their leaves arranged in a tight rosette. The leaves are entire, ovate to lanceolate, some with a petiole, and some sessile. Some species have dimorphic leaves. The rosettes can be a few centimetres across to almost 30cm (P. gigantea). Pinguicula species can be grouped into two main categories based on their growth cycles: tropical and temperate. In both groups there are heterophyllous and homophyllous types. Temperate heterophyllous species form hibernaculum (winter bud), made up of non carnivorous leaves during the winter. Tropical heterophyllous species produce a vegetative rosette of non carnivorous leaves to survive seasonal drought. P. moranensis in vegetative rosette form, with previous summers carnivorous leaves still present. Pinguicula with strongly lanceolate leaves. Pinguicula have the simplest carnivory method, using their leaves to trap small insects. The upper surface of the leaf is covered in two types of glands. The first is the peduncular gland which are secretory cells on top of a stalk cell. They produce a sticky mucus that covers the leaf. The mucus traps small insects to the leaves. Some species are able to fold their leaves slightly, putting more glands in contact with their prey. Once the insect is trapped the second type of glands, sessile glands, release enzymes that digest the inner contents, leaving the exoskeleton. The digested fluid cocktail is then reabsorbed though cuticular holes in the leaves. It is thought that these holes increase water loss through transpiration which is why, in drier periods, plants will produce non carnivorous leaves to conserve water. It is this sticky mucus texture that gives them their common name ‘Butterworts’. There are about 80 species known (Legendre, 2001), which updated on the last Monograph by Casper (1966). They are found across all continents except Australia, and are particularly species abundant in central and south America. Genlisea are annual or perennial herbs with short, erect stems. Their leaves are dimorphic, with one form as a dense basal rosette on the surface (leaves 0.5-5cm long), which is photosynthetic, and the other type (rhizophylls) that are subterranean. These subterranean leaves capture prey as well as provide anchorage and water absorption, much like roots. They are a cylindrical-shaped stalk that widen below the surface into a hollow bulb, the utricle, and then continue down as a hollow cylinder that bifurcates into two furrowed helices. A slit runs along them to allow their prey entry, but inward pointing hairs stop their retreat, forcing the unlucky creature to travel in the only direction possible: into the utricle. There, the prey is digested by enzymes. The trap system has been well documented, and the prey identified as protozoans (Barthlott et al., 1998). A very recent Monograph by Fleischmann (2013) puts forward 29 species found across tropical South America and tropical Africa. Molecular work has shown members of Genlisea to have the some of the smallest genomes in the Angiosperms (Greilhuber et al., 2006). The basal rosette and inflorescence raceme of Genlisea filiformis. Utricularia are annual or perennial herbs that grow across a variety of habitats as terrestrials epiphytes, and aquatics. Their vegetative parts are even more difficult to discern than Pinguicula and Genlisea, but appear to be made up of stems and modified leave like structures, with some species having subterraneous rhizomes, stolons or tubers. Roots are absent, but terrestrial species have root like stems, while aquatic species do not. The leaves vary hugely, being in rosettes, alternate, opposite or verticillate (forming one or more whorls) at stolon nodes. The lamina can divided (common in aquatic species) or entire. Leave shape can be lanceolate, peltate, reniform, and sessile or petiolate. It is rare for leaves to be completely absent. The traps are ovate vesicles called utricles on a short stalk off the pseudo stems. However U. neottides appears to lack traps in many cases (Taylor, 1994). 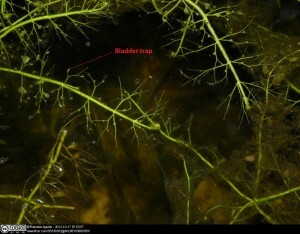 Recent work has shown that there are diverse microbial communities within Utricularia traps, which may have a mutualistic association with the plant (Sirová et al., 2009). 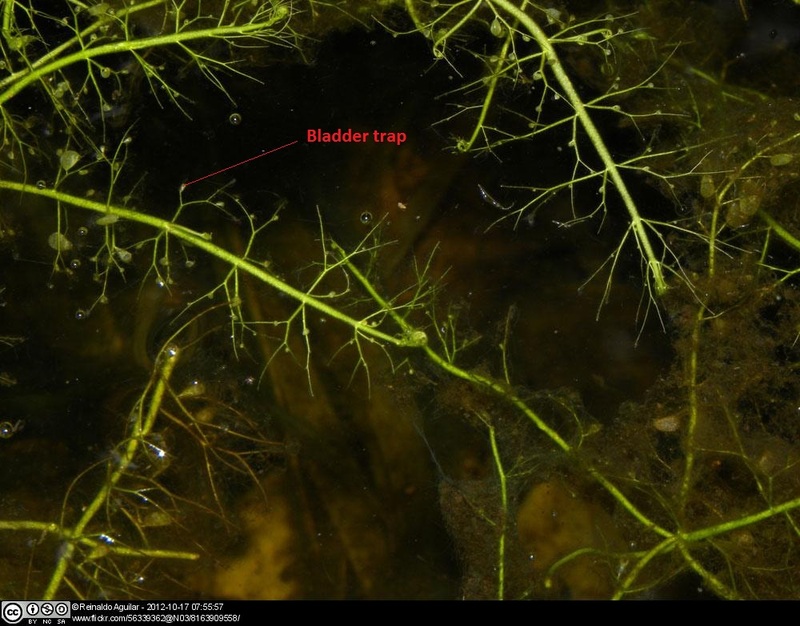 The traps are found on nearly all aquatic species, and are tiny, half a milimetre or less size, and work by using stored elastic pressure to open and close a trap door like opening so fast it cannot be observed occurring with the naked eye. Vincent et al (2011) were able to record the trapping motion using high-speed video imaging, and found it occurred in less than one millisecond. The rapid fluid acceleration means prey have very little chance of escaping. Taylors (1994) comprehensive monograph on Utricularia recognised 214 species. Since then further species have been described, bringing the total number to 228 species (Fleischmann, 2012). Utricularia have been recorded growing on nearly every continent, with the exception of Antarctica. Where do Lentibulariaceae sit in the Lamiales? Phylogenetic studies of Lamiales that sampled a representative of Lentibulariaceae identified the family as monophyletic (Jobson et al., 2003; Müller et al., 2004). But there is no clear evidence on the closest relatives to Lentibulariaceae in Lamiales. Müller et al (2004) had Bayesian and Likelihood trees that put Bignoniaceae as a sister to Lentibulariaceae, though not well supported. It is thought that close proximity to proto carnivorous genera within Lamiales, such as Byblis and Ibicella would be most parsimonious, as a single emergence of carnivorous adaption. Byblis has been shown to be a close relative from early rbcL analysis (Albert et al., 1992), but statistical data was lacking. Byblis was seen as closest relative in a number of later studies (Bremer et al., 2002; Jobson et al., 2003) which is what likely lead to its inclusion in APGII (2003), though now Byblis is in it’s own family in APGIII. 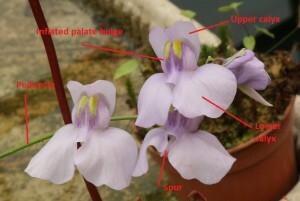 Muller et al (2004) found Byblidaceae and Martyniaceae not to be sister families to Lentibulariaceae. There is a general consensus that more needs to be done to decipher the infrafamiliar relationships within Lamiales (Albach et al., 2005; Hoggard et al., 2003). Studies show that Lentibulariaceae is monophyletic, with Pinguicula branching off first as a sister clade to Utricularia and Genlisea (Jobson et al., 2003). One of the key steps in the move to carnivory by the most recent common ancestor of Lentibulariaceae are the absorptive glands, which are attached to tracheid elements (part of the xylem), which consist of one epidermal cell supporting an endodermoid cell and glandular head cells in two’s (Müller et al., 2004). These glands are capable of absorbing organic substances such as amino acids, from the decomposing insects that are caught . Stalked glands are found in a number of families in the Lamiales, as secretory glands to protect against insect predation. In some cases the production of mucilage has been has been recorded trapping small insects called “defensive trapping” (Juniper et al., 1989). Whats more, there is evidence that the glands are able to shift from secretion to absorption (Ziegler and Lüttge, 1959) and so it is easy to see how a switch to carnivory in nutrient poor conditions is highly possible and advantageous. Reading University’s herbarium has a number of species from the Lentibulariace present within it’s collection, a few of which are shown here alongside a ruler (cm) to show the sizes and variation in some of the genera. The inflorescence raceme of Utricularia hispida. Utricularia gibba showing it’s strongly divided leaves, and inflorescence raceme(middle left). Pinguicula antarctica, showing basal leaves, adventitious roots, and inflorescence. inflorescence raceme and flower of Utricularia subulata. Albach, D. C., Meudt, H. M., and Oxelman, B. (2005) Piecing together the “new” Plantaginaceae. American Journal of Botany. 92: 297–315. Albert, V. A., Williams, S. E., and Chase, M. W. (1992) Carnivorous plants: phylogeny and structural evolution. Science. 257: 1491–1495. APG2 (2003) An update of the Angiosperm Phylogeny Group classification for the orders and families of flowering plants: APG II. Botanical Journal of the Linnean Society. 141: 399–436. Barthlott, W., Porembski, S., Fischer, E., and Gemmel, B. (1998) First protozoa-trapping plant found. Nature. 392: 447. Bremer, B., Bremer, K., Heidari, N., Erixon, P., and Olmstead, R. G. (2002) Phylogenetics of asterids based on 3 coding and 3 non-coding chloroplast DNA markers and the utility of non-coding DNA at higher taxonomic levels. Molecular Phylogenetics and Evolution 24: 274–301. Casper, S. J. (1966) Monographie der Gattung Pinguicula L. Bibliotheca Botanica. 127/128: 1 – 209. Fleischmann, A. (2012). The new Utricularia species described since Peter Taylor’s monograph. Carnivorous Plant Newsletter. 41: 67–76. Fleischmann, A. (2013). A Monograph of the Genus Genlisea. UK: Redfern Natural History. Greilhuber, J., Borsch, T., Müller, K., Worberg, A., Porembski, S., and Barthlott, W. (2006). Smallest angiosperm genomes found in Lentibulariaceae, with chromosomes of bacterial size. Plant Biology. 8: 770–777. Heywood, V. H., Brummit, R. K., Culham, A. and Seberg, O. (2007). Flowering Plants of the World. Richmond: Royal Botanic Gardens, Kew. Hoggard, R. K., Kores, P. J., Molvray, M., Hoggard, G. D., and Broughton,D. A. (2003) Molecular systematics and biogeography of the amphibious genus Littorella (Plantaginaceae). American Journal of Botany. 90: 429–435. Jobson, R. W., Playford, J., Cameron, K. M., and Albert, V. A. (2003). Molecular phylogenetics of Lentibulariaceae inferred from plastid rps16 intron and trnL-F DNA sequences: implications for character evolution and biogeography. Systematic Botany 28: 157–171. Juniper, B. E., Robins, R. J., and Joel, D. M. (1989). The Carnivorous Plants. London: Academic Press. Kubitzki, K. (2004). The Families and Genera of Flowering Plants. 7: 276-282. Springer-Verlag. Legendre, L. (2000). The genus Pinguicula L. (Lentibulariaceae):an overview. Acta Botanica Gallica 147: 77-95. Müller, K., Borsch, T., Legendre, L., Porembski, S., Theisen, I., and Barthlott, W. (2004). Evolution of carnivory in Lentibulariaceae band the Lamiales. Plant Biology 6: 477–490. Smith, N., Mori, S. A., Henderson, A., Stevenson, D. W. and Heald, S. V. (2004). Flowering Plants of the Neotropics. Princeton: Princeton University Press. Taylor, P. (1994). The genus Utricularia – a taxonomic monograph. Richmond: Royal Botanic Gardens, Kew. Vincent, O., Weißkopf, C., Poppinga, S., Masselter, T., Speck, T., Joyeux, M., Quillet, C. and Marmottant, P. (2011).Utra-fast underwater suction traps. Proceedings of the Royal Society B. 278: 2909-2914. Ziegler, H. and Lüttge, U. (1959). über die Resorption von 14C-Glutaminsaure durch sezernierende Nektarien. Naturwissenschaften. 46: 176-177. This entry was posted in Low Nutrient Environments, Species and tagged Bladderwort, Butterwort, insectivorous. Bookmark the permalink. Tom, I notice we have a small aquatic bladderwot in the pond – it looks like U. gibba. I didn’t knowingly plant it so wonder if it came with the Salvinia?